I have been visiting the Long-eared Owl nest in my neighborhood about once a week to check for hatchlings and to see how they have weathered the recent storms. I hoped that my regular and peaceable visits to the exact same rock outcropping would help Momma and Papa LEOW get used to my presence. 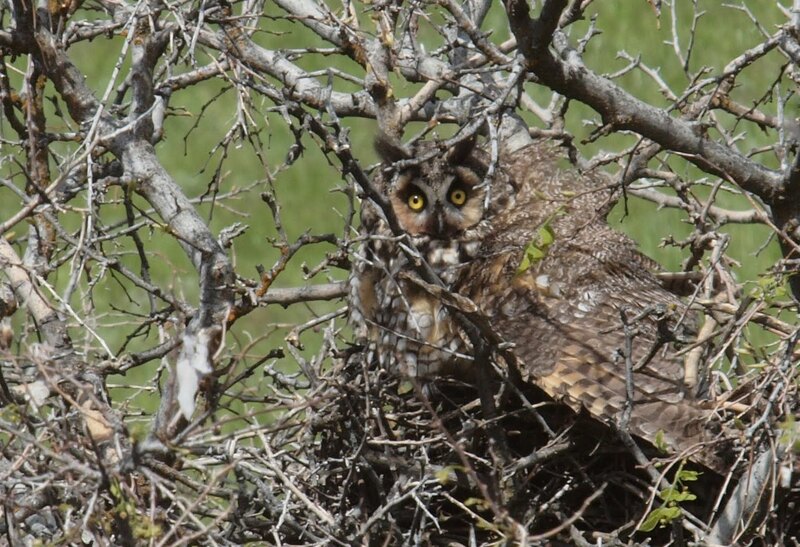 Normally, Momma sits immovable, hunkered down deep in the nest; her eyes unblinkingly fixed upon me. Papa is usually below her, well camouflaged against the trunk of the hackberry tree. Yesterday morning, however, was different. I am delighted to report that I did see at least two white n' fluffy owlets peaking out from under Momma's backside. Papa was at his usual perch, obviously aware of me, but unmoved by my presence. But now with vulnerable chicks, Momma was not at all happy that I was there. As I sat down on my typical viewing rock, she quickly puffed up, covered the chicks with her tail and wings, and starting clicking and hissing at me. She was down right ticked-off! I took this shot and then immediately backed away as she calmed down. I feel bad that I had aggravated her. At the same time, it was extremely interesting to observe her defensive behavior. What a good concerned parent! That clicking and hissing were very intimidating sounds...and they worked on me!